lasted between 1967 and 1970. PTAD in a statement on Wednesday said President Muhammadu Buhari approved the payment of pensions for retired police officers who were granted a presidential pardon in the year 2000. They were granted pardon by the then president, Olusegun Obasanjo, after serving in the defunct Biafran Police during the 30 months Nigeria Civil War. The police personnel who were granted presidential pardon by the former president have till date not received their pensions. At the flag-off in Enugu, 162 officers who have never been enrolled and 57 next of kin who also haven’t been paid their death benefits received their payment. 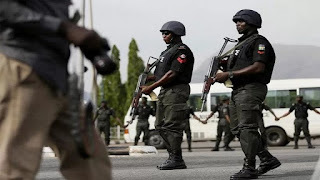 In her remarks, the executive secretary of the directorate, Sharon Ikeazor, who was appointed by President Muhammadu Buhari in October 2016 said the verification exercise which was conducted in late 2014 and early 2015 resulted in identifying 460 of the police officers who were caught up in the civil war but have since not been paid. “Despite the presidential pardon and verification of these officers, many of them remained unpaid for years,” she said. She added that the flag-off exercise marks another milestone in reintegrating the hitherto neglected police officers who have suffered untold hardship over the years. Mrs. Ikeazor said the gesture represents another decision by the federal government to bring closure to the painful legacies of the civil war. She assured that the present administration’s reforms under PTAD will ensure that Nigerians who spent the productive years of their lives serving the nation will not experience difficulties in getting their pensions. Responding on behalf of the pensioners, the president of the association of war affected police officers, Mathew Udeh, thanked President Buhari and PTAD for what he described as bounties showered on retired war affected police officers. He expressed happiness that the arrears of gratuity to all pensioners and pensionable officers will henceforth be paid monthly. The association of retired war affected police officers, ARWAPO, are pensioners who took sides with the secessionist state of Biafra during the Nigerian civil war. They were dismissed from the police in 1971 after the civil war but they were later pardoned and granted amnesty by former President Olusegun Obasanjo.